ITZY's debut song 'Dalla Dalla' MV has surpassed 100 million views for the shortest time in the history. The music video for "Dalla Dalla," the debut song of the "2019 Power Rookie" ITZY, has made a new history of K-pop, surpassing 100 million views for the shortest period in the K-pop debut group's history. ITZY's "Dalla Dalla" MV, unveiled at midnight on Feb. 11, surpassed 100 million views on YouTube around 1:40 p.m. on April 8. The result, which was achieved 57 days after its release, proved once again as "super rookie" status with the shortest period in K-pop debut group's history of over 100 million views. 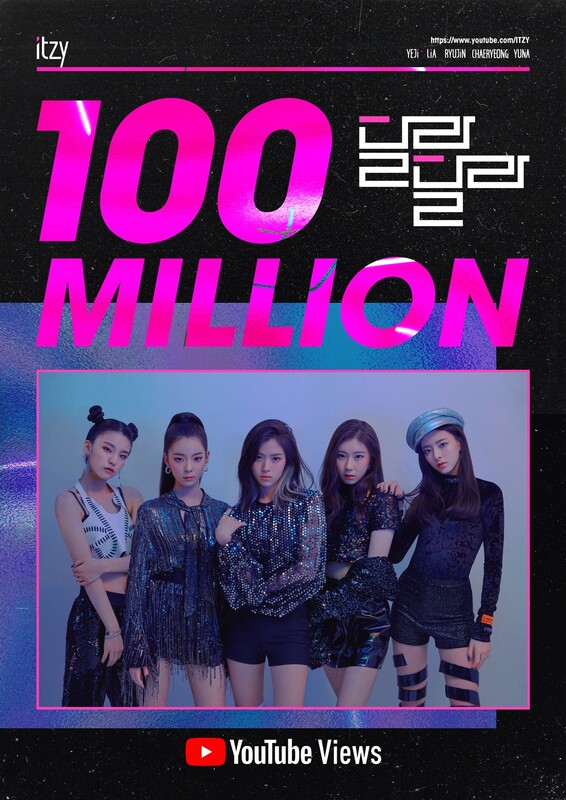 In response, JYP Entertainment posted an image to commemorate the 100 million views of "Dalla Dalla" MV through ITZY's official SNS channel and thanked fans at home and abroad for their explosive support. With their debut, ITZY set various new records, signaling a "best rookie of the year 2019" appearance. They won a total of 9 gold medals on music broadcasting, including seven gold medals on the terrestrial network, even after the end of their "Dalla Dalla" activities, and set an unusual record as a rookie. Especially, it has also set the record for the shortest period of time for terrestrial music broadcasting among K-pop girl groups. JYP's ambitious five-member girl group ITZY released their first digital single "IT'z Different" on Feb. 12 and made their official debut.